What is a river erosion? - World Rivers Become a Patron! River erosion if one of the most potent agents in sculpting the surface of the Earth. The enormous energy of the water causes destabilizes the riverbed. As a result, rivers cut their own valleys deepening and widening them over long periods of time and carrying away the sediment that mass wasting delivers to valley floors. in the plains, rivers erode its sediment and meander through the floodplain. The above image depicts the river erosion. Trees that were standing on the river bank just a few days ago are now toppled and in the water. The leaves are still green. It is for some apocalyptic scene, but if it is in nature, it is the scene of birth. River erosion is a natural process in almost any river. Some of the erosion is enhanced by humans, like water waves resulting from a sudden release of the dam, sometimes daily in a regular pattern at some dams (hydropeaking). Water has the energy (resulting from the gravity force) which is spent partially on the river bed. The higher is the energy, the stronger is erosion. The most visible is the erosion of the river banks, but it happens in the river bottom too. Streams erode rock and sediment in three ways— hydraulic action, solution, and abrasion. Hydraulic action refers to the ability to flow water to pick up and move rock and sediment. The force of running water swirling into a crevice in a rock can crack the rock and break loose a fragment to be carried away by the stream. Hydraulic force can also erode loose material from a stream bank on the outside of a curve. Solution, although ordinarily slow, can be an effective process of weathering and erosion where water can chemically dissolve the rock. Limestone, for example, is susceptible to this action, also a sandstone, where the water can dissolve calcite cement, loosening grains that can then be picked up by hydraulic action. The erosive process that is usually most effective on a rocky streambed is abrasion, the grinding away of the stream channel by the friction and impact of the sediment load, mostly sand and gravel. In most cases, the river erosion starts from the very beginning, the river source. Usually, the river source is in the mountains that are steep and the river is fast, full of rapids and energy. Here it erodes the big rocks and creates the loose sediment that travels just like the water, mostly on the river bottom, but sand and silt are transported in the water column as suspended particles. Such deposit has a range of sizes, from boulders through cobble, gravel (pebble), sand, silt ). Usually, the side erosion is not so significant here, because the underlying bedrock is very hard. Thus, rivers don’t “move” much sideways. The same applies to canyons. Downstream, however, the river flows through much softer alluvial plains primarily through its sediment that has deposited through millennia. The side erosion, seen from the first picture is much stronger. The erosion of the river banks is constant, resulting from weathering both from the air and water (I will not to technical). The erosion is extreme during the seasonal (completely natural) floods, where river obviously has much more energy than in normal circumstances. Because of the erosion, the river is moving laterally, id.e. it is meandering. The erosion is usually coupled with sediment deposition at the same time. It could be harmful to the human infrastructure if it is too close to the river. Natural ecosystems, however, are adapted the erosion – pioneer vegetation proliferates, colonizing plant saplings can survive on bare sand or gravel. Erosion is usually regarded as just taking the land, but then, the river would be kilometers wide. It is clearly not the case, as always river offset it with the sediment deposition on the other side. Actually, the cycles of river erosion and sediment deposition is the creative force in the landscape, as it resets the natural habitat succession, from the newborn point bars to the forest, with all transitional phases (meadows- shrub- young forest- mature forest), each step with its complete sets of flora and fauna. Learn how dynamic riveris a key to the biodiversity. Without erosion, there would eventually be just the last, final stage, the woods, with much-reduced biodiversity. This is the case in regulated rivers with embankments (rip-raps, culverts, groynes, and other artificial bank protection). Speaking the embankments, river can’t move laterally, but the energy must be spent. So, the river is eroding its bottom, causing river bed incision, or river bed instability and degradation. 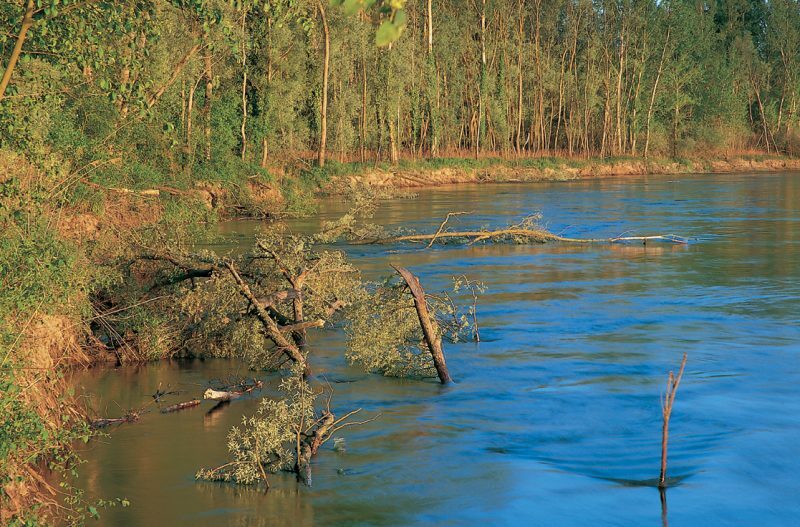 See a short video about the Drava River with strong erosion that creates extraordinary landscapes and biodiversity.